Who would have though that heavy chunks of real train rails would make one of the most amazing pieces of tablet stands imaginable. 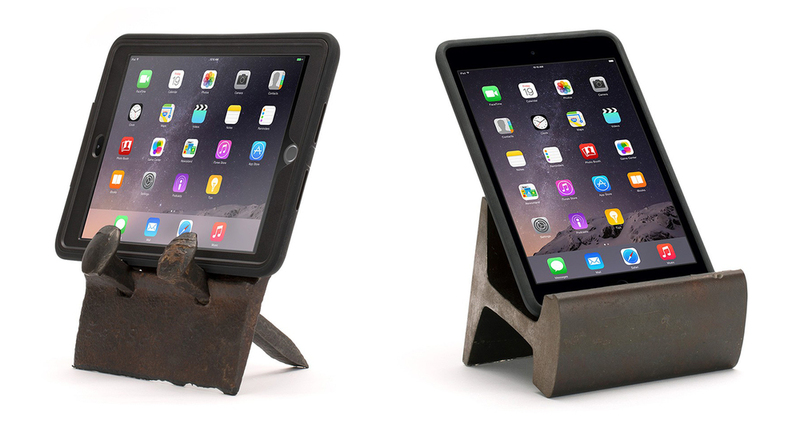 Griffin has collaborated with Rail Yard Studios to create one-of-a-kind, hand-made gritty tablet stands, each costing $130 and artistically fashioned out of reclaimed decommissioned rail stock and railroad spikes forged out of steel. The Rail Artifact Stand is made up from two railroad spikes welded to a flat tie plate once used to hold down parts of the rail creating an angled back support for virtually any tablet. The less grungy-looking Rail Slice Stand is a solid slice of a 12-inch wide railroad rail weighing a hefty 11 pounds, and features a CNC-milled cavity for your tablet's charging cable connector. Both stands were made to hold full-sized and small tablets in either portrait or landscape orientations. XFLEX is one really useful piece of hardware that has been long overdue in our world of tablets and smartphones. 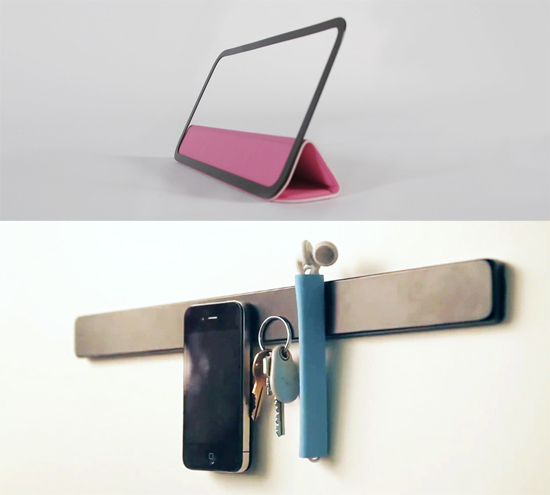 It can be used to stand virtually any tablet or smartphone. It has two detachable pieces that can fit in a purse or backpack and can be used in a million and one places. The XFLEX is made up of two pieces, one being a flexible arm and the other being a weighted base made of aircraft aluminum. There is one connection hole on each side of the base that allows maximum accessibility where the arms can attach via magnets. For as simple as the device is, it is truly the real deal in all-in-one accessories. Use it on any flat surface, wedge it between your couch cushions or fit it in the back seat pocket of a car for easy video viewing. Why get other single purpose products that only work for specific devices (mostly iOS ones) when you get a high quality, US made all-in-one device. XFLEX currently has a Kickstarter page up to raise enough funds so they can lower production costs and keep it manufactured in the US. As of writing this, they have hit half of their $20,000 goal. You can get it for $40 off on their Kickstarter page or order it immediately on their website. Much like the HoverBar, this flexible iPad stand is less glorified but claims to have more compatibility with other tablets as well. It's called the Bendi, a Kickstarter project. It employs a heavy duty suction cup mount that attaches to the back of any iPad including the soon to be released iPad 3. Additionally, the suction cup mount will attach to any similar tablet designed with a flat and smooth back making the Bendi just a little more practical than the HoverBar. Bendi takes the weight off your gentle hands using a flexible, 22-inch long goose neck that can easily be manipulated in endless angles with a rubber lined clamp at the other end that secures onto the side of a desk, table and various furniture. 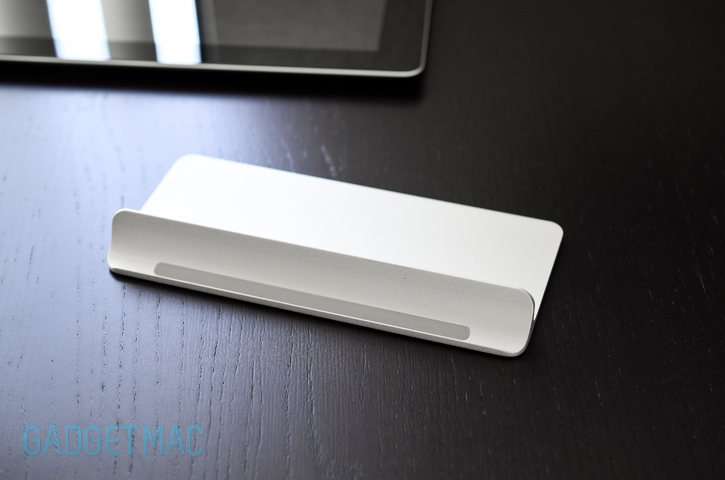 The guys behind the Bendi, Moonlight Studio, will eventually release a magnetic base as another form of attachment. The Bendi is available to pre-order right now for $55 over at Kickstarter. Thanks for the tip, Eric! Suction cups are so very useful and were once commonly used on just about everything. iLoveHandle's Barnacle is a multi-purpose dual suction cup stand mount that sticks to the flat surface of gadgets like the iPhone 4 and iPhone 4S allowing for car windshield mounting, desk mounting and other sorts of flat and slick surfaces you can think of. And it's quite a sucker too, capable of securely sticking to your phone even on a bumpy car ride. 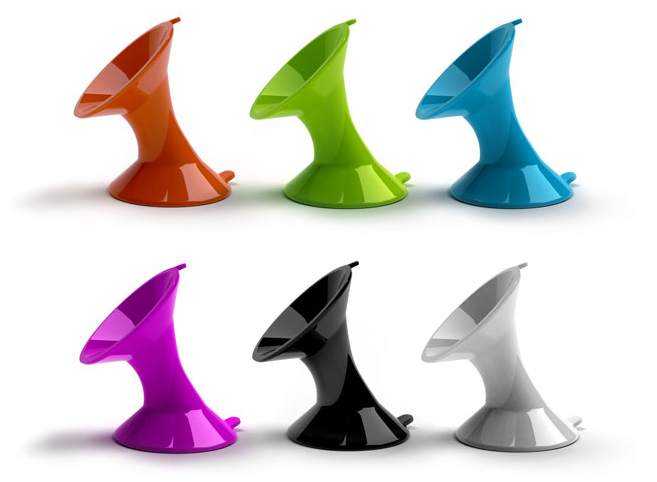 The Barnacle stand mount comes in many colors for $4.95. One of the more affordable mountable stand solution you can find. Thanks for the tip, Rich! 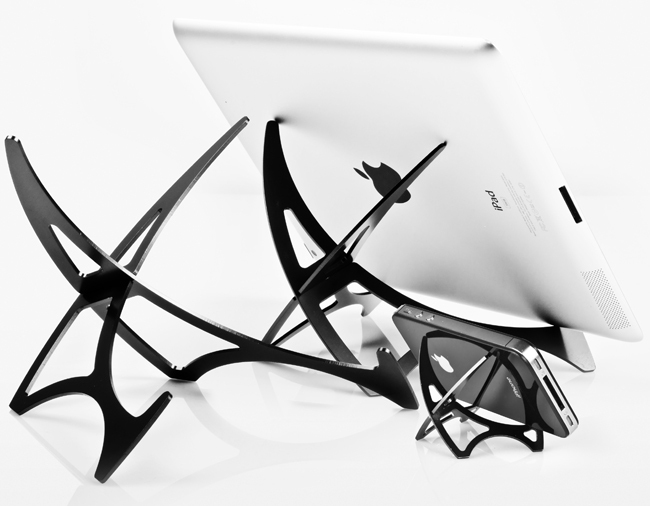 Prepare to be blown away with this amazing, magical stand made specifically for the iPad 2. 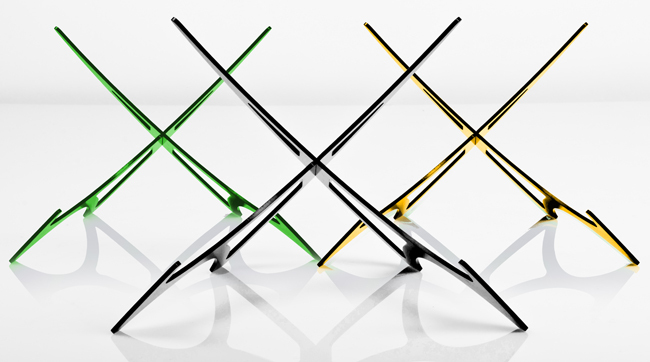 Ten One Design has revealed its Magnus stand at CES 2012. This aluminum slab of wonderness is designed to attach magnetically to the embedded magnets within the iPad 2 to keep a very sleek profile showing no visible support for a gravity defying work of art. 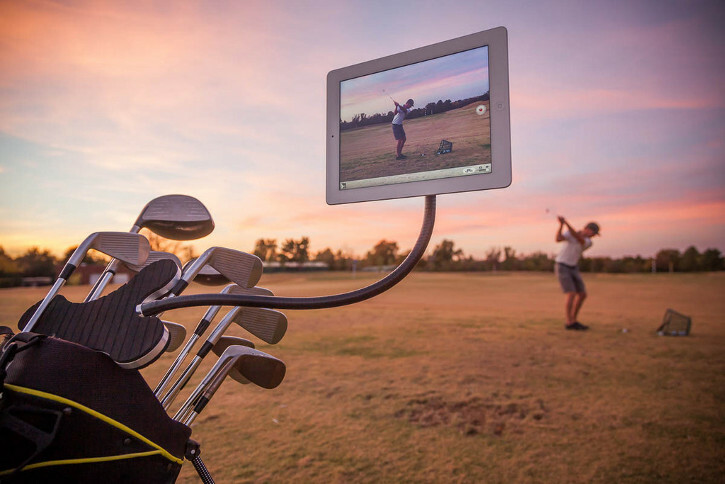 The Magnus has to be one of the most innovative iPad 2 stands we've ever seen. Which begs the question, why didn't Apple make such an awesome stand? The Smart Cover was great and all, but this. This is something better. 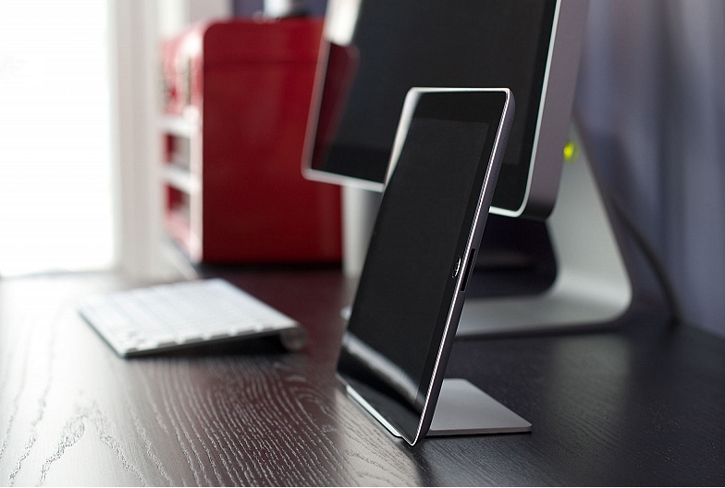 The Magnus stand has rubber feet at its base and will only work with a naked or skinned iPad 2 in the landscape orientation. So when can you grab yours? Good thing the Magnus is available for the taking right now for $49.95. Hub Innovations has released a few stand offerings at CES 2012, but only one of them has caught our attention. It's called the Prizm. A stand that is a sleek architectural masterpiece that might remind your of the movie District 9 even. It's made from aluminum alloys and precious metals like 14k gold. Comprised of two identical parts, no thicker than a pencil, this stand slides together and creates what Hub Innovations calls the most versatile stand on the market. We can agree to disagree on that statement. Available in two sizes, the Prizm is a portable universal stand capable of holding anything from iPads and tablets, books and notepads to smartphones and MP3 players. This low-profile stand comes in several anodized colors as well as premium metals like 14k gold, antique brass, antique copper, antique nickel and carbon fiber. It doesn't look like those sharp metal prongs have any form of padding from where we're standing and Hub Innovations has noting to say regarding that. The Prizm stand ranges in price from $24.95 to $34.95 and beyond. We've speculated in the past whether Apple would make Smart Covers for the iPhone 5, but pair of designers wasted no time waiting and have come up with TidyTilt. 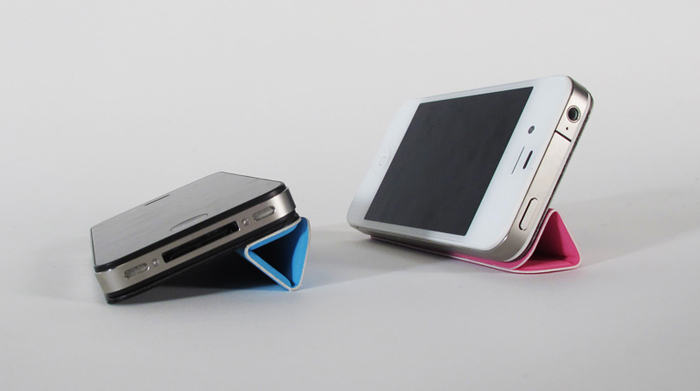 This miniature Smart Cover-esque accessory was designed for the iPhone 4S and iPhone 4 to enable multiple magnetic stand positions like Smart Covers do with the iPad 2. Rolling the TidyTilt into a mini triangle not only serves as a versatile stand for the iPhone but it'll also keep your in-ear headphones wrapped up neatly inside when folded up. In order for the TidyTilt to mimic how a Smart Cover works and compensate for the lack of integrated magnets in the iPhone 4S and iPhone 4, a thin magnetic metal frame with a residue-free adhesive sticks to the back of the iPhone and auto-aligns the TidyTilt cover with its embedded magnets into its place while keeping it securely attached to the iPhone at all times. It can also easily detach from the frame when needed. The metal frame also doubles as a protective edge that keeps the back glass of your iPhone scratch-free while adding some magnetic clinging abilities strong enough that you can stick your iPhone onto any magnetic surface. Other than some compass interference, TidyTilt and all these magnets aren't going to harm your device. Like all promising things, TidyTilt is a Kickstarter project waiting to come to life with the help of backing. By the looks of it, we think TidyTilt will become a reality quickly. Who wouldn't want a mini-me Smart Cover for their iPhone? Granted TidyTilt isn't actually covering and protecting the front screen of the iPhone, but we will have to leave that to Apple and the magic of embedded magnets. You can pre-order yours in four different colors for $19. Check out the video after the break!